The need to find new approaches to the development of cities is becoming increasingly urgent in this age of continuing population growth, demographic transition, climate change, fossil fuel peak and biodiversity losses. Restoring ecosystem services and promoting biodiversity is essential to sustainable development – even in the built environment. 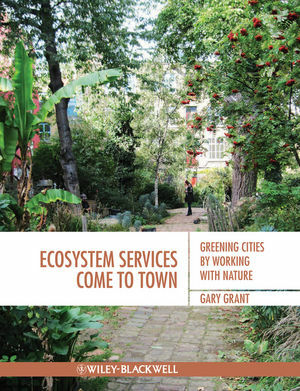 Ecosystem Services come to Town: greening cities by working with nature demonstrates how to make urban environments greener. It starts by explaining how, by mimicking nature and deliberately creating habitats to provide ecosystem services, cities can become more efficient and more pleasant to live in. The history of cities and city planning is covered with the impacts of industrial urban development described, as well as the contemporary concerns of biodiversity loss, peak oil and climate change. The later sections offer solutions to the challenges of sustainable urban development by describing and explaining a whole range of approaches and interventions, beginning at the regional scale with strategic green infrastructure, looking at districts and precincts, with trees, parks and rain gardens and ending with single buildings, including with green roofs and living walls. Technical enough to be valuable to practitioners but still readable and inspirational, this guide demonstrates to town planners, urban designers, architects, engineers, landscape architects how to make cities more liveable. Gary Grant is a Chartered Environmentalist, Member of the Institute of Ecology and Environmental Management, an Academician at the Academy of Urbanism, Member of the All Party Parliamentary Committee on Biodiversity, thesis supervisor at the Bartlett Faculty of the Built Environment, University College London, Chair of the Judges of the Integrated Habitats Design Competition and Director of the Green Roof Consultancy Ltd. As director of EDAW and then AECOM Design + Planning and now independent, he has worked on large scale planning projects including the London 2012 Olympic Park, the Bedford Valley River Park, the Whitehill-Bordon Eco Town, Education City, Qatar and Saadiyat Island, Abu Dhabi.